Apartments starting from Rs.6.74 Crs. 11 WEST is a 15 storied Under Construction Project and the location is Plot No.11, Gulmohar Road No. 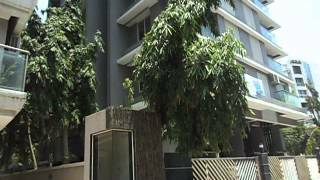 12, Near Kaife Azmi Park, JVPD, Juhu and is developed by Parinee Realty Pvt.Ltd.. 11 WEST was launched in May 2010 and the possession of the same is likely to be in Sep 2018. 11 WEST has 2 flats per floor. Bare shell flats will be provided by the builder. Anyone buying a flat in 11 WEST gets 2 covered car parks. The car parking in this building is basement and mechanical. There are various payment schemes for the buyers like subvention, flexi payment plans and deferred payment plans. 11 WEST is RERA approved has the Registration Number bearing P51800003709. 11 WEST is tagged as RERA Approved / Self Use. Parinee Realty Pvt.Ltd. also has other under construction and ready possession and sold out projects like 34 East, 11 WEST, Parinee Aria, Liva Roca, Parinee Kyoto, Parinee Anand Villa, Tapan, Parinee Adney, Parinee Essence, Almog. The property prices in Juhu are in the range of 30000 to 40000 for Outright for ready and under construction projects. Parinee Realty Pvt.Ltd. currently has 5 Under Construction projects. 11 WEST has good reviews and the ratings of this project are approximately 4 out of 5. You can download the brochure of 11 WEST and you can see the latest digital pictures, Floor Plans, Location Plans & Rate History on our website. The Bookings for the Under Construction project 11 WEST are open and we can set up a Site Visit any time at your Convenience. 11 WEST is approved by most of the Banks and for more details on the approved bank list, please connect with us. 1257 sq.ft. Carpet - Base Price ₹ 6.98 Crs. 1215 sq.ft. Carpet - Base Price ₹ 6.74 Crs. 1292 sq.ft. Carpet - Base Price ₹ 7.17 Crs. 1342 sq.ft. Carpet - Base Price ₹ 7.45 Crs. 11 West details were updated in Apr 2019. 11 West - Parinee Realty Pvt Ltd Approved by the following Banks in Mumbai, Thane and Navi Mumbai. Click on the link below to download a Printable 11 West Project Brochure.